“Stripe” is a 1-and-a-half year old female cat. The Fayette Regional Humane Society is hosting “Adopt Love,” a special adoption event with reduced fees for the cats and kittens. Adopting from a humane society gives a lifetime of love. “All of our adoptable kitties have been vaccinated, spayed or neutered, dewormed, treated for fleas and microchipped,” said Brad Adams, outreach director at FRHS. There are currently 22 cats housed at the FRHS Adoption Center, located in downtown Washington Court House. This means there is a large variety of personalities where adopters can meet their forever match. “They need someone to care for them and show them love,” said Bobbi Honicker, adoption coordinator. The adoption donation for cats will be $20 and $50 for kittens. The Fayette Regional Humane Society is a non-profit (501(c)(3), volunteer organization. They receive less than 2 percent of their support from governmental organizations and therefore must rely on donations, grants and fundraising to carry out their mission. The Humane Society is the only organization in Fayette County able to respond to calls about abused, neglected and injured domestic animals, 24 hours per day, seven days per week. 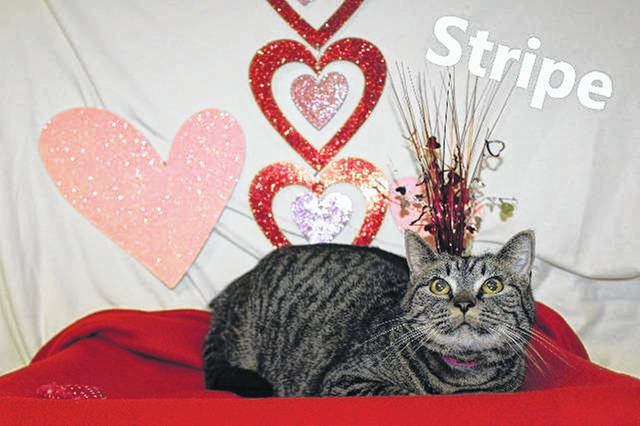 https://www.recordherald.com/wp-content/uploads/sites/27/2019/02/web1_stripe.jpg“Stripe” is a 1-and-a-half year old female cat.